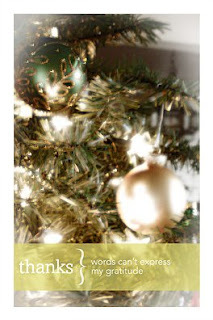 Here's an idea for making simple inexpensive thank you cards for your Christmas loot. I was inspired by these cards by Chris Ford at 2 peas. Take a photo of your Christmas decor, lights, presents, etc, and make thank you notes. I used a photo of our tree and applied a diffuse glow filter (FILTER>DISTORT>DIFFUSE GLOW). They're 4x6 so you can have them printed through your favorite service, or print them at home on white cardstock. Easy, and very classy. I love your countdown, you are so amazing and so generous with your time and talents!! !